In a Cambridge condo, a space designed by a mom for her two sons. 1 The beds, in mid-century modern style, are layered with a mix of prints. “I used as many patterns as possible without being obnoxious,” Anderson says. 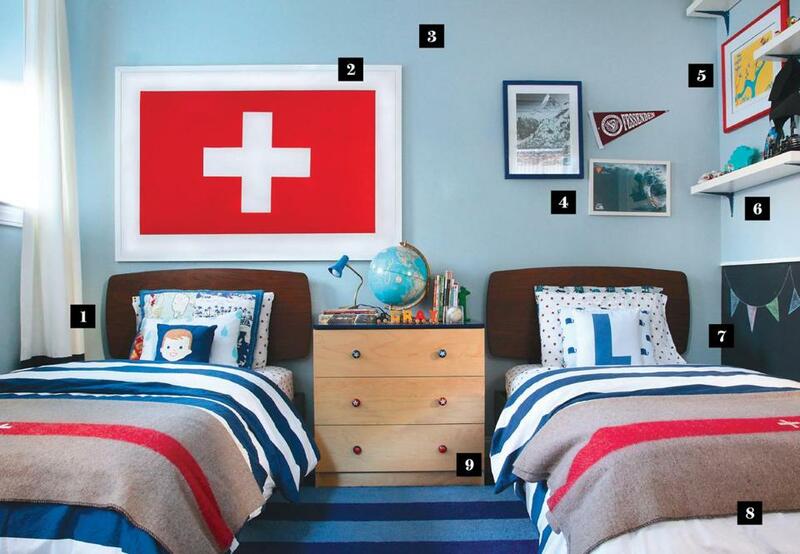 2 The Swiss flag is a nod to her husband’s birthplace. 3 When the room suffered water damage, Anderson repainted walls pale blue using Farrow & Ball’s Parma Gray. 4 A photo of the Matterhorn in the Swiss Alps represents the family’s love of skiing; the autographed surfer photo was a gift to her older son from her dad. 8 Authentic Swiss Army blankets are another tip of the hat to her husband’s heritage. 9 Anderson bought the dresser from friends for $50, lacquered the scratched top in navy, and swapped the knobs. 10 The surfboard belonged to a well-known surfer. Anderson’s dad got it in a raffle and had it signed for his first grandson. 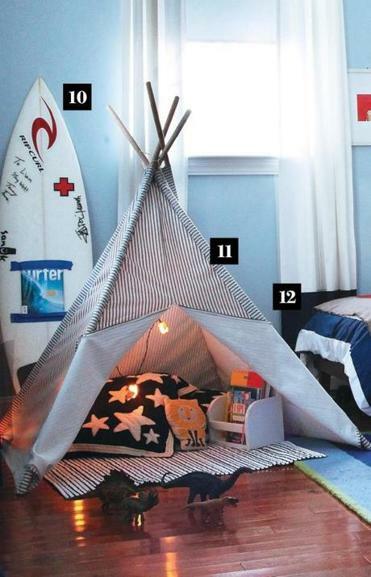 11 The teepee, strung with Christmas owl lights, is a cozy reading nook for father and sons. 12 Standard white curtain panels weren’t long enough, so Anderson asked her dry cleaner to sew a navy panel to the bottom.